Posted: Wednesday, March 28, 2012 2:18 pm | Updated: 2:29 pm, Wed Mar 28, 2012. When General Motors filed for bankruptcy in 2009 and decided to bet the franchise on four brands – Buick, GMC, Cadillac and Chevrolet – an almost universal cry could be heard. Buick? Buick? Are you kidding me? But, a few years later, it seems like a pretty good bet. The Buck Regal is sporty and elegant at the same time. The exterior looks sophisticated and, frankly, on first glance we didn’t think it was a Buick, much less a GM car. No, we were thinking Nissan, Acura or maybe Volvo. The Buick is no longer your grandfather’s car and it is attracting a younger audience with its lean lines and smooth ride. In fact, our Buick Regal gold mist metallic four-door sedan was showy enough for a Trader Joe’s employee to stop collecting shopping carts and admire it. Ironically, he said he always was a fan of the Regal but thought GM had stopped making them. He was genuinely happy that news of the Regal’s death were exaggerated. Inside, the car continues to look pricier than it is. GM says its key competitors are the Acura TXS and the Volkswagen CC and the marketing folks are touting this as belonging to the entry luxury category. We won’t completely make that jump. To us, it is a premium car with ambition. With a base price of $29,500, the leather was rich, supple and fitted. The two-tone – cashmere with cocoa – interior with leather and plastic was bold design rather than subtlety elegant but that may be more of a result of budget than design. The contoured ergonomically designed leather front seats were comfortable with side bolsters for added ease. Of course, helping this comfort is an 8-way power front heated seat with 4-way lumbar. There was plenty of room in the back of the 60/40 split folding seatback. We drove three large teenagers around Dunwoody without any grumbling from them about the ride or their comfort – even from the one sitting in the middle. Driving this car is uncomplicated and intuitive. Every Regal is designed and built to perform. The standard Regal includes performance features like a four-link independent rear suspension and electronically controlled 6-speed automatic transmission with Driver Shift Control for a “hands on” experience. The car comes with a 6-speed automatic as well as a CXL-Turbo 6-speed manual or a 6-speed automatic. The standard car has 182 horsepower with 172 of torque. The car gets 25 miles per gallon in the city; 36 miles per gallon on the highway. Overall, the ride is fine. It hugged curves well but sometimes was a bit hesitant in accelerating. Aiding the experience is the Interactive Drive Control continuously adjusts the suspension to optimize Regal’s response to every inch of the road. Choose from three driving modes: Sport, for a more dynamic driving experience; Tour, for long-distance cruising; or Standard, for daily commuting. A $2,000 option is the eAssist Technology whose aim is to save gas without sacrificing performance. The automatic start/stop technology optimizes gas consumption while regenerative braking and Regal’s Lithium-ion Battery Pack provide power to the cabin features. 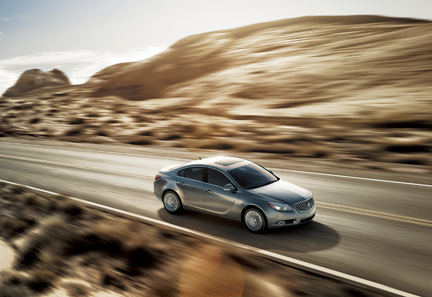 With driver-tuned agility that hugs turns and a new 336-watt Harman Kardon® 5.1 Matrix sound system that surrounds you, the 2012 Buick Regal envelopes you in a luxury performance all your own. The Premium II Equipment Group also includes rear seat thorax air bags2 and HID headlamps. An optional 2.4L 4-Cylinder engine with eAssist Technology offers an impressive EPA-est. 36 hwy MPG. Features on the base include 18-inch alloy wheels, automatic headlights, heated mirrors, fog lights, cruise control, dual-zone automatic climate control, remote keyless entry, leather upholstery, heated front seats, an eight-way power-adjustable driver seat, and an auto-dimming rearview mirror. The Regal is a solid safe ride as well. In fact, it was the 2011 Top Safety Pick from the Insurance Institute for Highway Safety. It also features an antilock brake system, stabilitrak-Stability Control system with traction control, a passenger airbag sensors and a tire pressure monitoring system. And, really isn’t Onstar a most fabulous feature for getting directions, selecting a bar-b-que shack in the next town or aiding in an accident? With a five-year, 100,000-mile powertrain limited warranty or four-year, 50,000 bumper-to-bumper warranty, GM is offering a car that is sporty enough for new young fans but with the comfort, ease of drive and standard and optional equipment that Buick’s long-time fans expect and deserve. GM just may have gotten it right this time. Karp Kia (www.karpkia.com) is a division of Karp Automotive (www.karpauto.com), a family owned and operated dealership since 1957 located in Nassau County on the South Shore of Long Island in Rockville Centre, NY between Baldwin and Lynbrook, handling all Volvo, Buick, Saab, and Kia needs. Since its inception, Karp Automotive has made a commitment to upholding its core values of integrity and honesty. Karp is an active member of the community sponsoring many local outreach programs, community service projects, and community development initiatives. This has made Karp Automotive widely regarded as “the Auto Authority” and providing a superior ownership experience. As our customers would attest, there are many places a person can purchase a vehicle, but only here will you be treated like family by family. This entry was posted in Buick Reviews and tagged 2012, Buick, Karp, NY, Regal, Rockville Centre. Bookmark the permalink.